Learn how to use a bread machine my way. 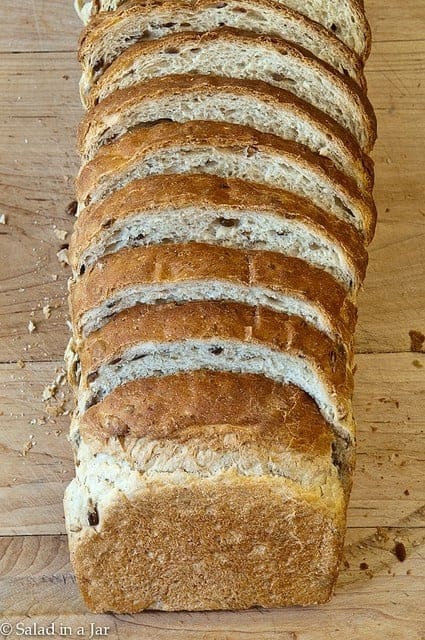 Don’t miss the recipe for Oatmeal-Sunflower Bread as pictured below. It’s one of my best bread recipes. No worries if you don’t have a bread machine. 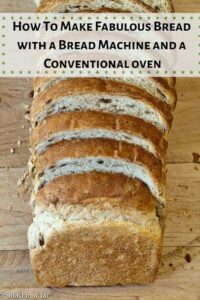 You can still make the bread either by hand or with a stand mixer with the directions for conversion here. This is the bread recipe I promised two weeks ago along with a picture tutorial for exactly how one takes bread dough from the bread machine to the oven. If you would prefer your bread with the crust and appearance of the bread on the right in the picture below instead of the crust on the left, follow me. 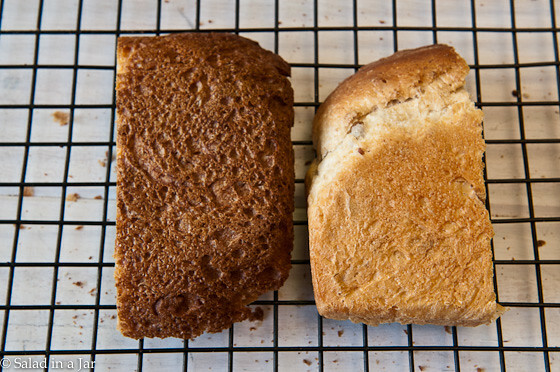 Left: bread baked in a bread machine. 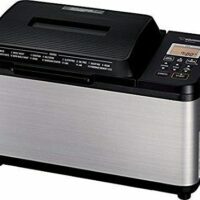 What follows are general instructions for changing any bread machine recipe baked in the machine into a loaf of bread you will be proud to serve and even happier to eat. Top left: Dump all ingredients into bread machine pan and select the “Dough” cycle. Top right: Dough should stick to the side of the pan, then pull away while going through the kneading process. Bottom Left: Bread will automatically rise. 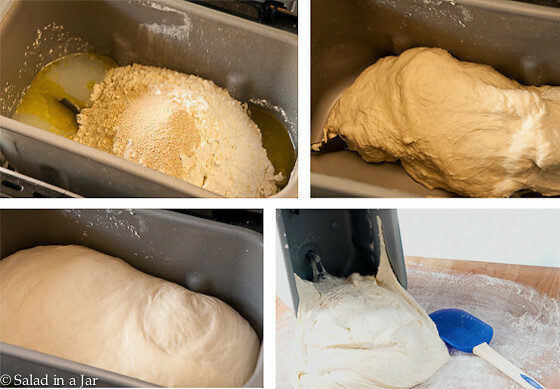 Bottom right: When dough cycle is finished and/or dough has doubled in size, remove it to a floured surface to shape. At this point, you can shape the dough however you wish. The following pictures show how to make a standard loaf. 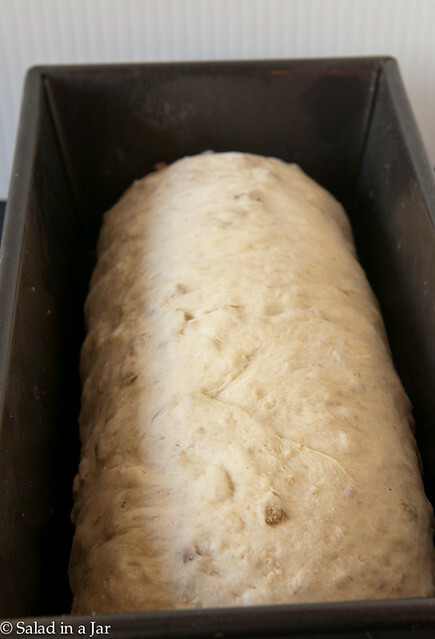 Roll into a rectangle with longest edge about one inch longer than your loaf pan. Begin rolling into a cylinder from the longest side. Tuck the ends under. How Do I Know Which Size of Loaf Pan to Choose? 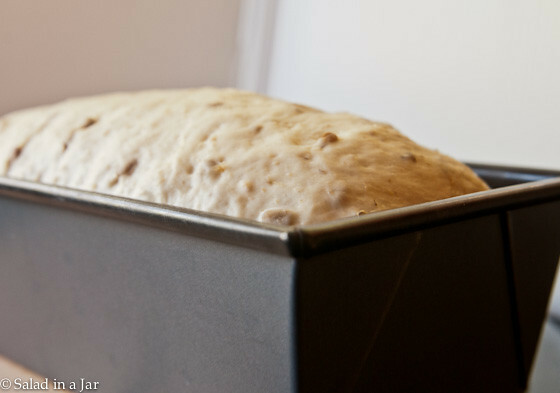 Deciding the size of loaf pan you want to use is crucial to the end result. Too small and your bread will rise out of the pan. Too large and your bread will appear squatty or like it wasn’t allowed to rise long enough. For a recipe with 3 cups of flour, my favorite size is 9 x 4 inches when measured on the bottom. (It will hold exactly 8 cups of water if you want to compare with a pan you already have.) Coat the pan with a vegetable oil/flour kind of spray such as Baker’s Joy for easy release. Place cylinder-shaped dough into loaf pan, seam side down. Pull each end out a bit and then tuck under so your loaf looks like the one in the picture. Set the loaf pan in a warm place to rise. My favorite way to create a warm place is to boil a cup of water in the microwave for 5 minutes. Leave it in there and place the covered dough next to it inside the closed and steamy microwave. DO NOT TURN ON THE MICROWAVE WITH THE DOUGH IN THERE. It will usually take 30-45 minutes to rise. I like to cover my bread while it’s rising with a hotel freebie shower cap (reusable). You could also use a tea towel or plastic wrap laid loosely over the top. The dough should rise to about one inch above the top of the pan. If it proofs too much, it may fall or have a big hole in the middle. You may not realize your error until you slice into the baked loaf. 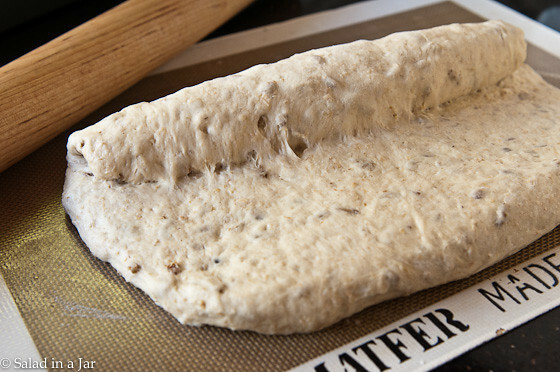 If the dough doesn’t rise enough, your bread will be compact and smaller than it should be. Keep an eye on it. This step is crucial. If you are using the right size pan, your loaf is ready to bake when dough peeks above the top of the pan about one inch. Besides choosing a pan, oven temperature is your next challenge. A good place to start is 375 degrees F for about 30-40 minutes. Some loaves may take more time or need to be covered half-way through the baking time. 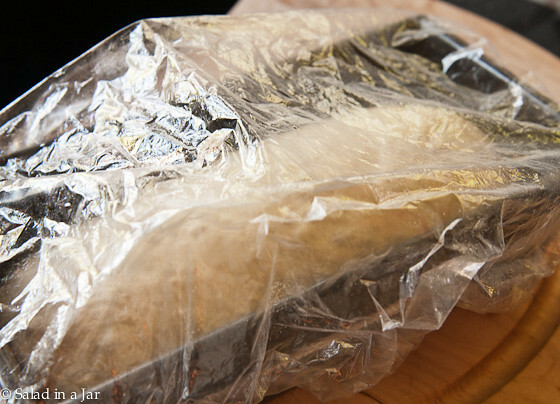 Foil will protect a crust that is browning too quickly. These details will require your attention the first time you make this bread, but once you make a recipe two or three times, you will figure it out. It’s worth the trouble! 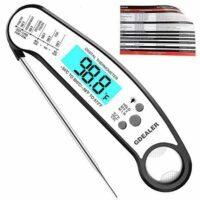 If you are a bread-making beginner, I can’t stress how helpful it is to buy a quick-read thermometer with a probe. I highly recommend this one for only $17. When you put the probe into the middle of the bread, it should read 190 degrees (or pretty close) when it’s baked all the way through. This particular loaf is a perfect sandwich bread because the flavors are rather unassertive and won’t compete with sandwich ingredients. Nevertheless, it’s more interesting and nutritious than a plain white loaf. To freeze, slice it first, then double wrap it. Oatmeal-Sunflower Bread has a mild, non-assertive but nutty flavor that's perfect for sandwiches and toast. Warm milk and water in the microwave for one minute on HIGH. Add to bread machine pan along with remaining ingredients except seeds in order given. Select "Dough" cycle and start. After about 5-10 minutes, lift the lid and add extra liquid or extra flour 1 tablespoon at a time, if necessary, to correct consistency. Dough should stick to side of pan, then pull away. 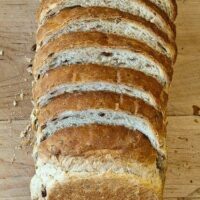 Add the seeds at the Raisin/Nut signal or 5-10 minutes before the kneading cycle ends. If you miss it, you can always work them in by hand when you get ready to form the loaf. When dough cycle has completed, remove dough to a floured surface and flatten into a rectangle. Roll into a cylinder. Place into a 9x5-inch greased loaf pan with the seam down and tucking the ends under. Loosely cover (I use a shower cap or tea towel) and set in a warm place until dough rises approximately 1 inch above the rim of the pan. Preheat oven to 350 degrees. Bake for 30-35 minutes or until internal temperature reaches 190 degrees F. I suggest you test it with a thermometer if you are a novice bread baker. Note: Check loaf half way through baking and cover with foil if getting too brown. Help! I Forgot To Add the Yeast. Can This Dough Be Saved? I made this one too, on the same Monday I made the crusty rolls and french bread!!!! A bread baking frenzy ? I haven’t got enough amount of sunflower seeds, so top up with flaxseeds, melon seeds and sesame seeds. Turn out fantastically tasty! The ladies of my church cell group absolutely love it ? May I know if I can turn this recipe into making bread sticks?? How should I adjust the baking time?? Thanks. So happy to hear you are enjoying the bread recipes. I have not tried making breadsticks from either of those recipes. You might take a look at these garlic breadsticks to give you an idea. Thanks. Will try that out. Paula, you make some great suggestions! By chance, do you have a good banana/apple sweet bread recipe, thats tried and true? My kids absolutely love it. But I am a novice at this and had to throw out some loaves without getting a good result so far. Thank you in advance! Thank you so much for sharing this technique! I had tried several times to make a loaf work in my machine, and they all kept caving in. 🙁 I guess it was rising too much. Now that I am letting it rise until I know it’s ready, the bread is perfect! Just one question though…my bread is measuring at 205 degrees after only 25 minutes. The bread tastes great, but I’m wondering if it would be even better if I turn the oven down? How low would you go? Most of my recipes are “tried and true” and I know they work with 2 teaspoons. That’s not to say they might be even better with 1 1/2 tsp, but I haven’t tried it. I probably should experiment with that. Do whatever works best for you. Thanks for the reply! I made my loaf in an 8×4. I could use the extra inch I am sure. Your microwave trick worked wonders. My bread making has been made so much easier thanks to you. Have a great night. First I want to say thank you for the microwave+water tip. My house is almost always cold and rising takes forever. Hopefully this solves my problem. Second, I noticed two of your recipes for bread, this one and the white with condensed milk call for different bread pan sizes. The 8×4 and the 9×4. I plan on making mostly whole grain breads using my machine or at least trying to. Which pan size do you think would be best? Thanks! 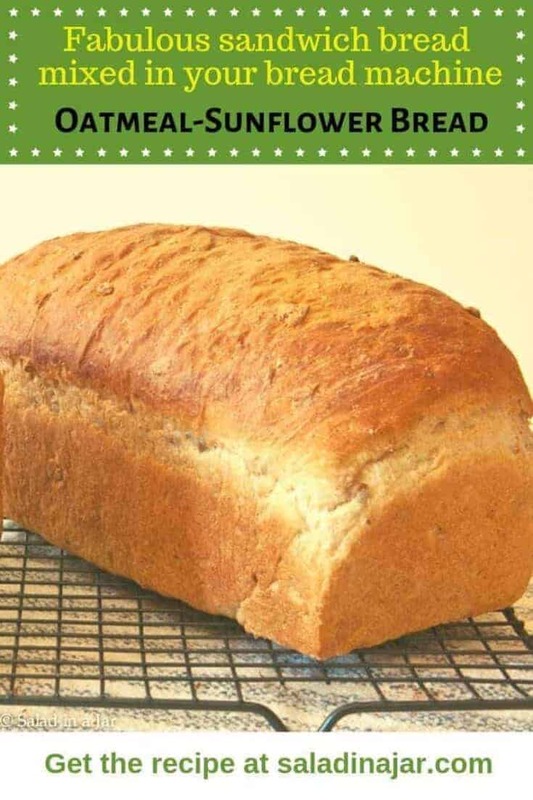 My favorite pan for a 3-cups-of-flour bread recipe is 9 x 4″. It will hold 10 cups of water when filled to the very top if you want to compare with a pan you have. Whole grain bread doughs usually don’t rise quite as much as the white but I would probably still use the same 9 x 4 inch pan. Love your idea of using chia seeds. How pretty! I’m going to try that on my next loaf. So I don’t knead the bread after it comes out of the bread machine? Just flatten into a rectangle & let rise the second time? Awesome idea with the shower cap! I will have to remember to take them next time we are away! I’m an avid baker and never would have thought of that one. Can this be done without a bread maker? If so, would I just knead the bread and set it out to rise, and how many times should I knead it? Sorry! New to breadmaking!! Yes, Stacey. You can make almost any of my bread recipes by hand, if you prefer, or don’t have a bread machine. I can’t give you a hard and fast rule about kneading because everybody’s technique is different. Knead until the dough is smooth, shiny and elastic. So, I totally did not ask that question right!! Sorry! I’ve read in some recipes that you knead the dough, then set it out to rise for a set amount of time, and then punch it down again and set it out to rise a second time. That’s my question…How many times do I punch it down and let it rise? You see, I’m a MAJOR rookie when it comes to bread making!! I would knead the dough. Then shape it into a ball and put it in a bowl to rise – until it is about double the size. Then take it out and shape it as described above. Then put it in the pan and let it rise again – until it is 1″ above the pan (as described above). Hope this helps! 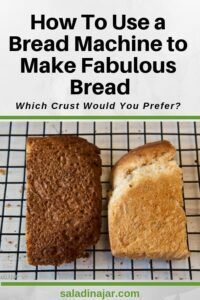 I googled how to make a loaf after it has been mixed in my breadmaker and found this site. I made the the Oatmeal-Sunflower bread and it tasted awesome. The best bread I have made. I followed your photo guide explaining what to do after the dough was mixed. Excellent!! 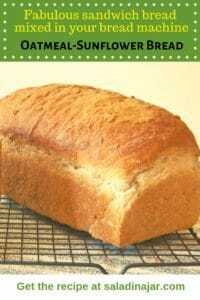 Thanks for posting this recipe and bread making guide for baking a loaf in the oven. You are correct. I almost never use anything but the dough cycle. 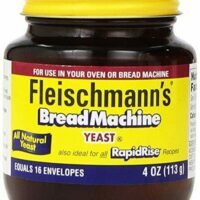 Occasionally, you might get lucky and make a pretty good loaf that is BAKED in the bread machine but if you want a reliable and far superior method with a more predictable result, use your machine for mixing, kneading and rising ONLY. That is what is does best. Fabulous! I was so excited to learn how to make a SOFT, actual looking like bread, bread. I had been using my machine and the bread that came out was hard and compact although it tasted good. I really wanted that “real bread” look. Now, having accomplished this with your great recipe, I am on to try other breads with your recipe as a base. Can I make dough ahead of time and freeze it? At what stage do I need to freeze it? Do I need to let it rise again after it thaws, then bake it? Thanks! Hi Heather, Glad you found me. I guess you checked my recipe index where you can find lots more bread recipes. I have a recipe for cinnnamon bread and also, herb bread but have not published them yet. Perhaps in the near future. Re: freezing the dough, I don’t normally recommend it with homemade dough. The stuff you buy at the grocery store has been specially formulated for freezing, unlike most homemade bread. I prefer to freeze the finished product. Be sure to wrap securely and don’t let it stay in your freezer more than a month or two. Paula, shortly after I wrote my message I found the link to all the recipes. They look great! Cannot wait to try. My husband was so excited about how soft the bread was for his lunchmeat sandwich he takes to work. He was used to the bread maker’s tougher bread and hard crust. Thanks again, I made two loaves this past weekend. This was delicious! Had to beat the kids off with a stick so I could have some. 😉 Thanks so much!! I just finished making this loaf of bread and I am eating my first slice. It is absolutely fantastic. I love your tips and pictures. You clearly explained every step and totally nailed it. Thank you! This loaf of bread turned out wonderfully. Thank you for helping me solve my bread machine crust problem. Hello…. this looks delish, and only one question… when you said once the cycle is completed means once it proofs the first time in the machine then punch and remove to a floured surface… or does it means as soon at the machine beeps remove to a floured surface…. a bit confused here, thank you much!!! You are right on the first one. Let the dough cycle complete which will mean the dough has risen once. Most machines will beep close to the end of the kneading portion when it’s time to add in nuts or raisins. Ignore that beep unless you want to add something like that. Looks great! 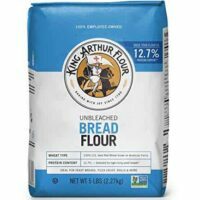 Can I use freshly milled whole wheat or would the recipe need to be altered? I made this bread last night, with minor adjustments, and absolutely fell in love with it! I love your use of the bread machine to knead it, and then baking. I am definitely inspired to not only make more, but buy less and less store bread. I am wondering though, what methods do you use to store it? 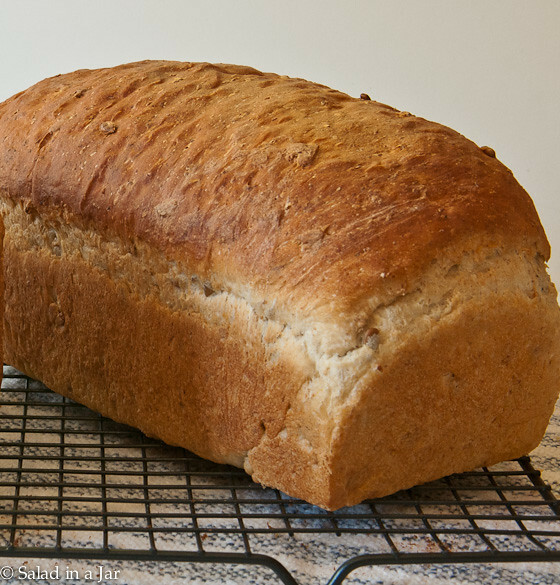 Storing homemade bread can be a challenge because it has no preservatives. Personally, I slice it, then put it into a plastic bag and then, into the freezer. I do this within 24 hours to maintain the freshness. Some recipes hold up better than others–bread with potatoes in it seems to stay fresh longest. Wow. Just wow. I bought a William Sonoma bread machine 15 years ago and put it away after making five or six bricks . I don’t really know why I decided to give it another try – but I’m so glad I found your site – and decided to give it another shot . I made the oatmeal white with sunflower seeds – and it’s unreal. It’s far better than what I’d hope for when I first bought the machine ! Thanks very much for your detailed and clear instructions. I’m looking forward to my next loaf/experiment! Congratulations! Thanks for taking the time to write. You made my day! The bread recipe was heaven. Great technique using the microwave for the rise cycle. Would this make dinner rolls? The texture was so soft inside and the crust was devine. I ate the inside first and saved the crust for last. yum! I haven’t tried it as dinner rolls, but I suspect they would be delicious. We used this bread for bacon and tomato sandwiches yesterday. So good! This recipe looks and sounds delicious – thank you for it and all your good suggestions. Yeah, i was thinking of when you had your blog, quite awhile back, and just for the fun of it i typed it in, and wow I am so happy to see you back! Welcome back! Great post! Thank you for the great tips and recipe.